Sarah Flax, Evanston's housing and grants administrator, fields questions as working groups discuss proposed amendments to the city's inclusionary housing ordinance. More than 50 developers, landlords, concerned residents and city officials gathered Monday night as part of a push to improve affordable housing in Evanston. 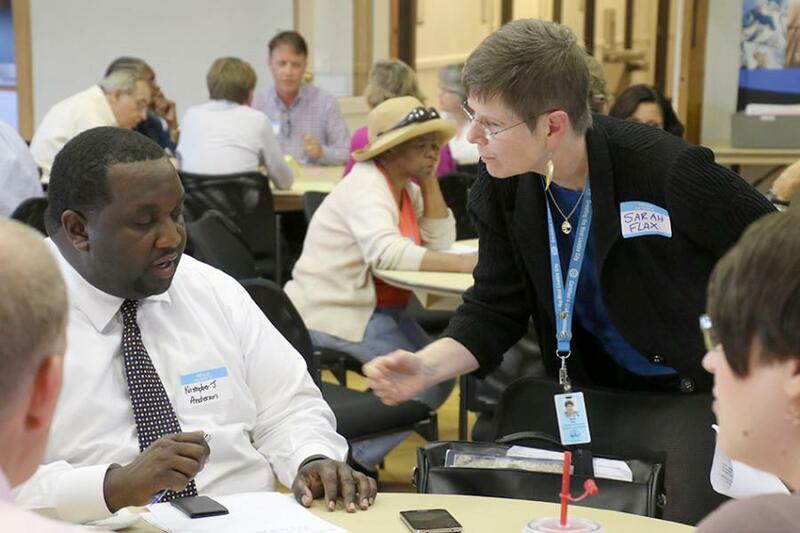 Groups of developers, landlords, concerned residents and city officials gave feedback on proposed amendments to Evanston’s inclusionary housing ordinance Monday night during a workshop held by the city. The meeting, held at the Civic Center, began with a brief presentation by city staff on proposed amendments created by the Housing and Homelessness Commission earlier in June that aim to update Evanston’s ordinance to better fit the current housing market and resident needs. Following the presentation, more than 50 attendees sat in diverse working groups — tables expected to have at least one voice from every stakeholder community — and reported on their discussions to the room at large. Core tenets of the city’s proposed amendments include a buy-out fee for opting not to build affordable units on site and a higher percentage of affordable units set aside in developments that include public funding, as well as better incentives for developers. The city’s plan also looked at varied revenue sources for affordable housing construction, such as remodel fees or property taxes. Attendees generally agreed with the proposed amendments created by city staff, though many groups suggested slight adjustments to figures like the proposed number of affordable units in small and large developments. Many groups, however, also voiced their desire for the construction of affordable units throughout the city, regardless of the area’s income level, as well as their belief that the cost burden of affordable housing should be shared by all Evanston’s residents. The working groups also provided the city a chance to hear perspectives they might have missed, Flax said. One group, which included several landlords, noted the proposed amendments overlooked incentives for landlords of smaller units. Although the ordinance amendments focus on large-scale developments, the majority of affordable units in Evanston are owned by local landlords in sites scattered throughout the city, Flax said. Flax said city staff will review and compile all public comments, both from Monday night’s meeting and those received through email, into a formal presentation for City Council. Until the presentation, not much can be known about where the ordinance will go, she added.